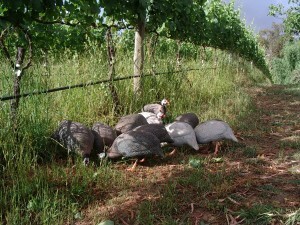 We’re pretty spoilt here in the beautiful Adelaide Hills. Each day is very special for different reasons and different seasons – and there are never any disappointments! Today I decided to do a pictorial documentation of ‘a day in the life’ of our Gruner Veltliner vineyard and I think it has turned out pretty good. A good day and some good pics! 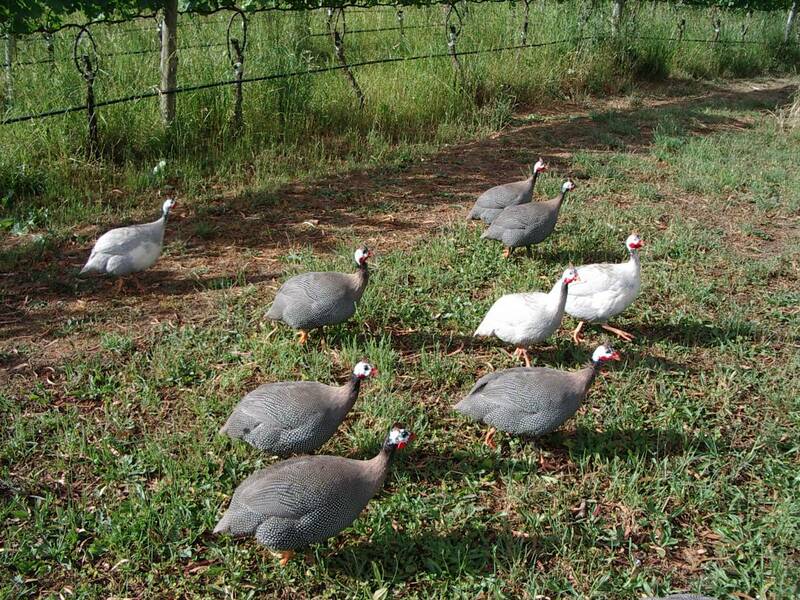 Every morning, one of my first tasks is to feed the guinea fowl with wheat grain. I use this to lure them into the vineyard, where their main task is to scrub around all day and eat the nasty bugs such as earwigs and garden weevils. This is very helpful with the biodynamic processes and, of course, helps us avoid ever having to use insecticides on the property. Here they are enjoying their morning feed of wheat grain – it looks pretty calm in the pic, but it does tend to be a bit of a bun-fight with lots of pushin’ an shovin’ and loud chirping. Now they have had their feed and they’re off to work. 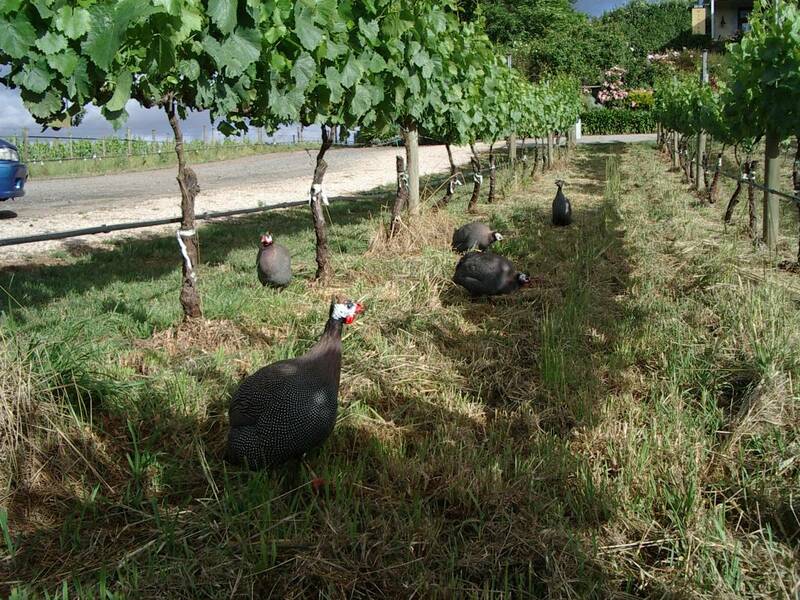 Here they are getting into their vineyard routine where they will move around as a mob and scratch away at the dirt and peck at anything that looks interesting. My next task for the day was to mow the undergrowth in the vineyard rows. I tend to allow the grasses and herbs to get a bit out of hand so that by the time I cut them down, they are able to contribute to a thick blanket of hay that is so very good for the vineyard. 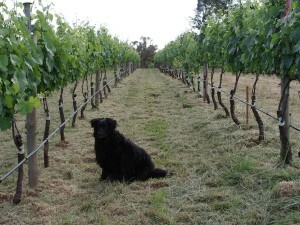 Here is a pic of the Gruner Veltliner vineyard before the mowing action. Young Nero is the star of this pic. And here is the ‘after’ pic. 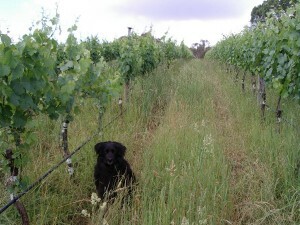 That is, after the undervine mowing machine has passed through and quite a bit of whipper-snipping. Nero looks suitably impressed! 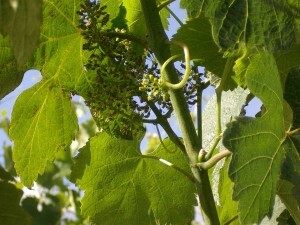 Finally, here is a picture of the newly formed Gruner bunches that will go into the 2012 vintage. They have finished flowering and have started to set. It is amazing to imagine that this fragile, pretty – almost lacy – early bunch of grapes will, in the next four months, be magically converted to a beautiful, fresh and crystalline glass of GRU. Great pictorial documentation. Like the way you don’t want to use pesticides by feeding the guinea’s, add another documentation as the season progresses. Thanks Jameson! Pleased you liked.